For today’s Cocktail Friday, we’re taking a look at one of my favorite drink categories: cocktails that riff on whiskey plus herbal flavors. There are at least two major families, the Manhattan (rye or bourbon and vermouth plus bitters) and the Boulevardier (rye or bourbon and vermouth plus Campari). The combination of the fiery and sweet in bourbon or rye set up nicely against the bitterness and herbal characteristics of bitters or amari (the general category in which Campari fits). The nice thing is that there are literally dozens of kinds of bitters and possibly hundreds of kinds of amari out there, and most of them are pretty different from each other because they each use proprietary blends of herbs and spices. So there are lots of ways you can make unique (if subtly different) drinks that follow this general recipe. Such is today’s cocktail, the Frank of America. Published in the New York Times by Robert Simonson, the cocktail originated in The Bennett in New York City and is named after the bar director’s boyfriend, named Frank, who works at Bank of America. 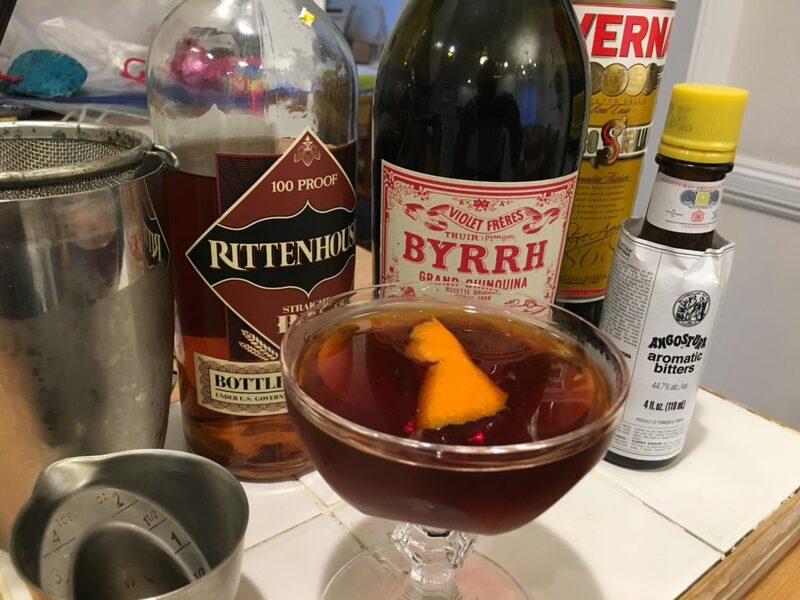 It calls for rye, Byrrh (a slightly more bitter vermouth analog), Amaro Abano (a strongly herbal, slightly peppery amaro), Angostura bitters, and maple syrup, with an orange twist. I didn’t have Amaro Abano so I substituted Averna, which is slightly less herbal and more spicy; I used bonded Rittenhouse Rye for the whiskey component. The result was a little sweet but amazingly complex and herbal. Apparently the original uses a spiced maple syrup; that might address the sweetness. But it’s definitely worth a drink if you have this stuff in your cupboard. Or experiment with other amari, vermouth or vermouth-like drinks, and whiskeys. There’s a lot of directions that a little experiment can take you. 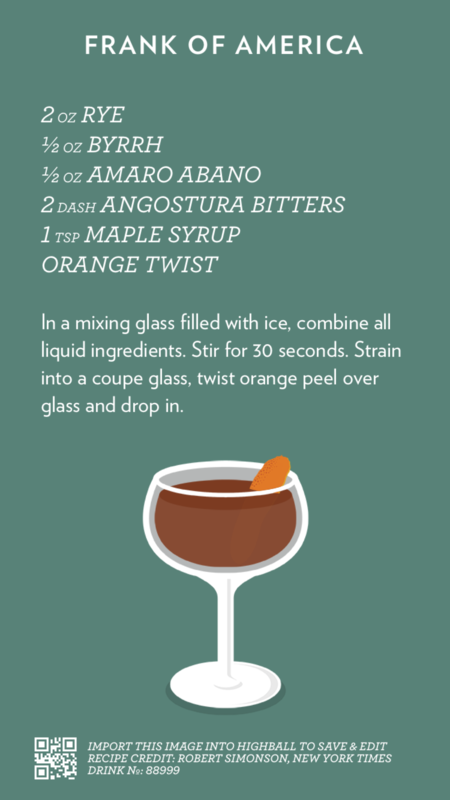 As always, here’s the Highball recipe card, if you plan to try it out. Enjoy!